The story goes that Joe Darpel (1900-1968) ran away from home in 1915 and joined a circus as a peanut seller. 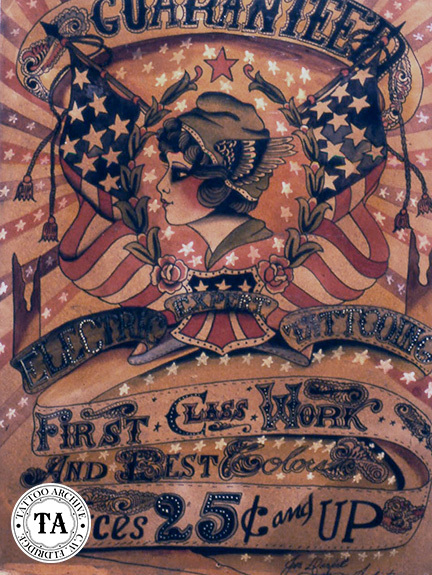 Bert Grimm stated in Lyle Tuttle’s Historian that he tattooed Joe Darpel from head to toe. Before Bert settled in St. Louis, he worked with Darpel at several different locations. Joe then took his Bert Grimm body suit on the road and worked as an attraction and tattoo artist for such outfits as the Greater Alamo Show and the Wortham Show in the 1920s. It is unclear whom Darpel learned to tattoo from. Mable Kenney-Darpel (1910-1976) was born in the show business world. Her father William Kennedy managed the Miller Bros 101 Ranch Shows in the early 1900s. Through the years Mabel worked in many different job in shows; knife thrower, mind reader and more. Joe and Mabel met on a show and by 1945 Billboard Magazine listed Joe and Mabel as Mr. and Mrs. Darpel. In a 1961 interview Joe said that he taught Mable to tattoo after they were married. Over the years they worked together in Junction City and Kansas City, Kansas Fort Worth and Waco, Texas, as well as Norfolk, Virginia to name a few. 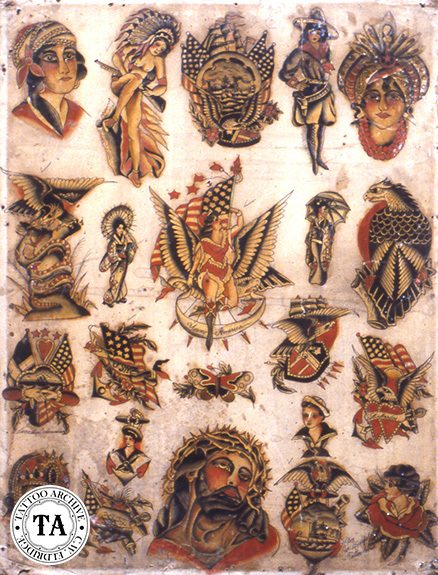 Joe and Mabel tattooed Jack Ross and their work is seen in photographs #734-#736 of Bernard Kobel's tattoo collection. 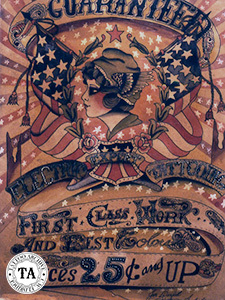 Many sheets of Darpel's beautiful flash have survived and are prized by collectors worldwide. Joe Darpel continued to travel with sideshows in the 1940s and even moved into management on some shows. A 1940s advertisement in Billboard Magazine listed Joe Darpel's supply business along side the likes of Milton Zeis and Owen Jensen. At this time Darpel was only selling Pelican Black ink, #12 sharps at $5.00 per thousand, and tempered sterling silver for contacts. His address was Suite 222, Victoria Hotel, Norfolk, Virginia. It is unknown if he ever expanded his line of tattoo supplies. A big thanks to Carmen Nyssen for her help with this update.